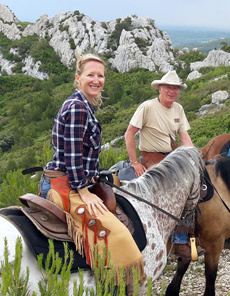 We offer in this region from 2 to 3 days horseback trails to discover the Bauxites lake, the Peiroou lake, the Baux lake, the Alpilles crests... so let's ride! Meeting point at the stables around 9.30 a.m with a welcoming coffe to meet the team and the other riders. 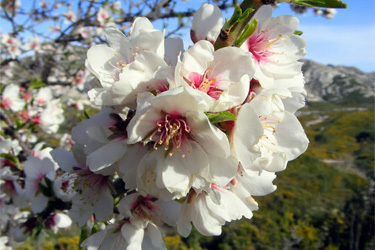 Today, going along wonderfull cliffs of white rock, we ride beetwin garigues and pine forests to get to the Peiroou lake. Peiroou is the Provençal name of the cauldron which refers to natural cavities of rocky grounds due to erosion. At midday, picnic under the pine shadow. 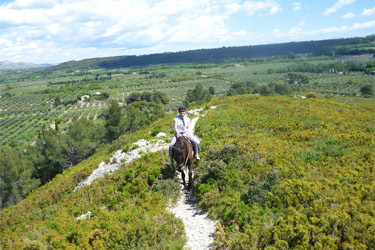 Back on the saddle, enjoyable shady paths border our trail at the heart of the Alpilles natural park and offer exquisite panoramas. On the evening, our very special canteen welcome you for the bivouac step ! An old firefighters' vehicle transformed in kitchen and a canteen tent to taste a delicious hot meal. Projection of your photographs and films of the day on big screen, night in tents or tepees. 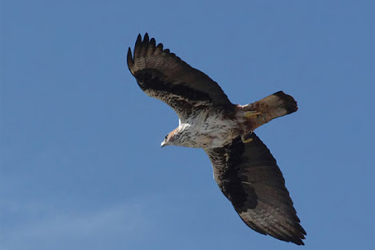 The broom fragrance or Bonelli eagles majestic flight lead us to a magic place this morning. The entire landscape is red colored, we could think that we are in Colorado. Suddenly appears a majestic turquoise water lake, the contrast is striking! 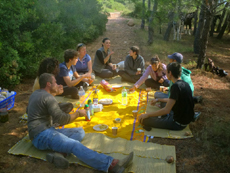 In the spectaculary setting we eat a good and copious picnic before going back riding accross olive groves and pine forests. Diner and night at the bivouac. Important : This riding tour is given on an indicative basis. 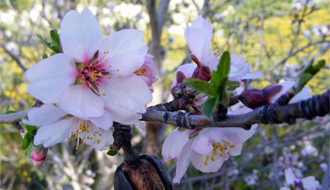 Depending on the seasons and the meteorological conditions during the tour, the guide may modify the tour. 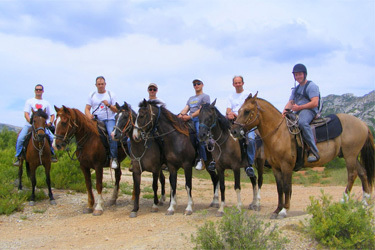 - The trail ride as described in full board basis, from the lunch of day 1 to the lunch of day 2 or 3 depending of the chosen option. - Protection of the French Law for travel consumers who book through French travel agencies (see "why ride with us ?"). 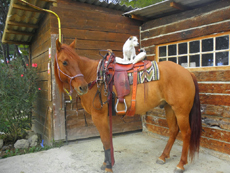 We use australian, Mac lellan or western saddles. Saddlebags are not provided but you can bring yours to carry your personal equipment during the day. 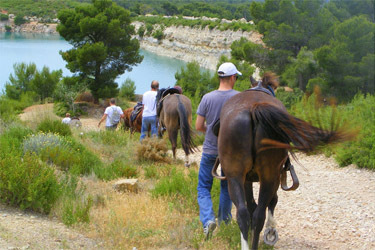 To join this trail, you have to be comfortable at the three gaits in open spaces, and to be able to ride outdoor in various grounds. 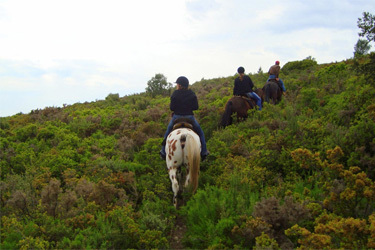 It can be your first time outdoor riding over several days, but novice riders are not accepted. We ride 5 to 6 hours per day. 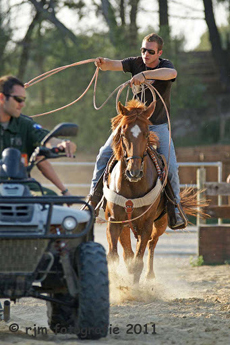 Each rider is responsible for his horse: feet, detection of small scratches, brushing, and saddle. We travel between 20 and 30 km per day and the rocky ground could be sometimes steep. Accompanied children are allowed from 10 years old if they are good riders and from 12 years old if they are alone. 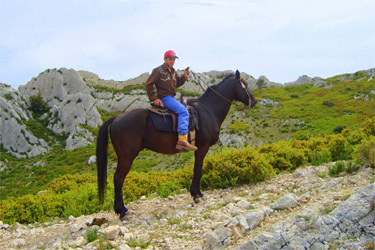 This trail is guided by experienced and qualified guides. 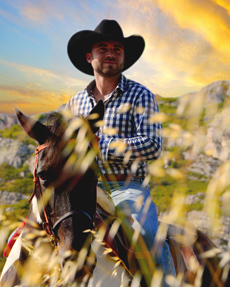 Sébastien, the main guide is both France and Europe champion of team roping and will propose an introduction to his passion over the week-end. An assistance and safety vehicle provides us with lunch and dinner on a daily basis. We offer an accomodation in bivouac with 2 people teppee tents. No individual accomodation possible on this trail. The bivouac is done in the entire respect of nature (solar pannels energy, biodegradable washing-up liquid, biodegradable shower gel put at your disposal, composting toilets). The intendancy vehicle brings us delicious hot or cold meals for lunch. You will have a pastis or rosé wine glass, bruised olives and tapenade made in the Mas, a ratatouille with olive oil and vegetables from the garden, and finally you will have a "pénéquet" (a Provencal rest!) before riding again… Enjoy! The dinners in the Mas are a family and Provencal cuisine. The basic product is olive oil made in the Mas! The evening, an old firefighters' vehicule transformed in kitchen welcome you to taste a hot meal and enable to project photos and films of the day on a big screen. Languages spoken by the guide: French, English and Italian. Meeting at the riding centre at around 9.30 am. The closest airports are Marseille or Nimes, and the closest train stations are Avignon and Arles. Transfer by taxi. If you come by train, plan your arrival on the day before the beginning of the trail. You can also stay one extra night after the end of the riding tour. Details are given in the travel journal for these services reservation. 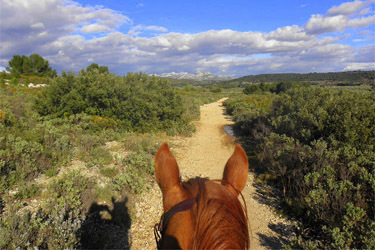 Provence scents, colors, and friendly encounters make this riding trip a memorable experience. 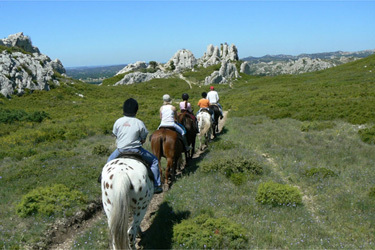 The beauty of the Alpilles regional Park. 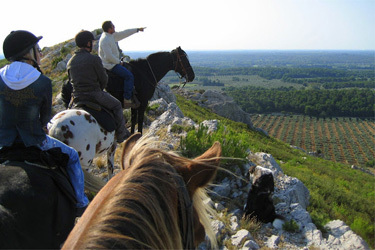 A spectacular ride in the so-called Provencal Colorado. A week ride around the nicest castles of the Loire Valley.